A roaring fire was the reason that this WWII Japanese Cargo vessel ran aground the reef and sank. Sank in 1942 after catching fire and then hitting the reef when the captain tried to run her aground. 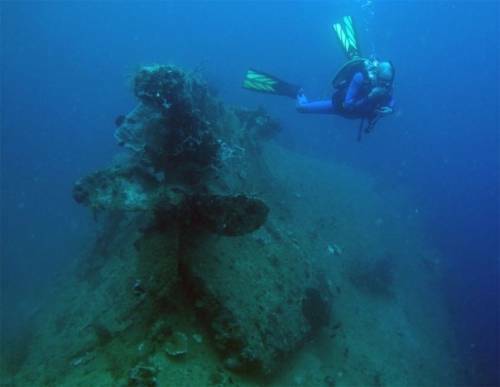 This 50 meter long Japanese Cargo Wreck now lies in 47m of water with the propeller at the stern the shallowest part in 25m. The wreck is covered with encrusting sponge, sea whips and sea fans. Grouper, scorpionfish and lionfish have all made their home on the wreck. On the sloping reef there is more scattered wreck debris plus patches of hard coral and anemones with their resident anemone fish. Reef fish include wrasse, sweetlips, cardinalfish and fusiliers.